Attendees at the Ocean City Flower Show took time to smell the elaborate displays. Kay Reilly turned to two workers at the Ocean City Music Pier on Friday afternoon and asked them to play something fun over the sound system. “What about, ‘Take Me Out to the Ball Game?’’’ she suggested. While the classic baseball anthem might be appropriate for say, a Phillies-Cubs game, some might question its selection as the musical soundtrack for a flower show. But Reilly and Kathy Wheatcroft, co-chairs of the 45th annual Ocean City Flower Show, wanted to throw the fans a curve ball this year. 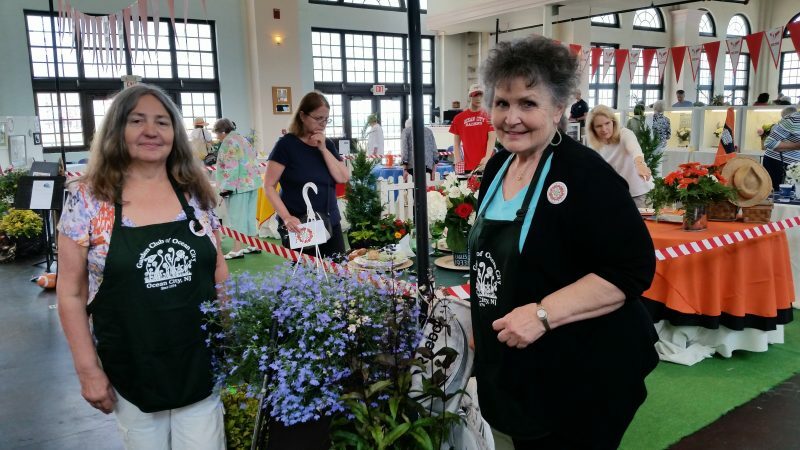 Ocean City Flower Show co-chairs Kathy Wheatcroft, left, and Kay Reilly touted the high quality of the floral arrangements. When the flower show opened Friday, for its weekend run at the Music Pier, attendees got their first glimpse of 85 floral displays combined with baseballs, footballs, surfboards, ice skates, golf clubs and other objects of the sports world. “I’m admiring everything. 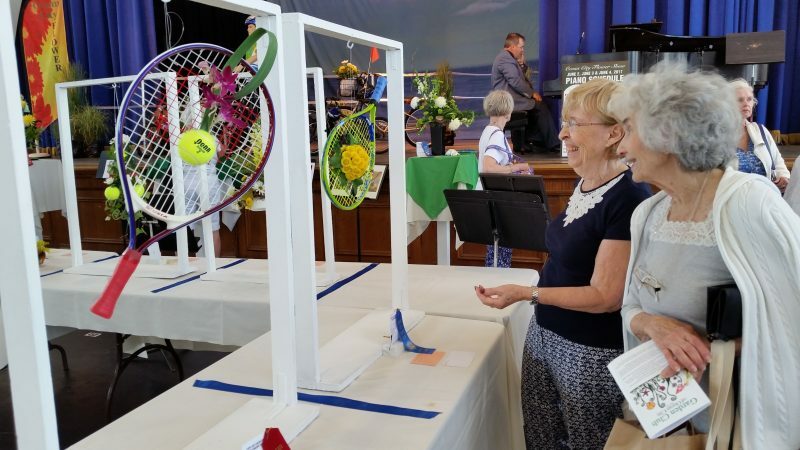 It’s beautiful,” Phyllis Pace, a flower show aficionado, said while complimenting exhibitor Joann DiNunzio on one of her award-winning creations, a tennis racket decorated with yellow chrysanthemums. Pace, who lives in Feasterville, Pa., and has a summer home in Longport, said she has been attending the flower show for years. Joann DiNunzio, in dark top, shows Phyllis Pace her first-place-winning creation that combined a tennis racket with chrysanthemums. Pace and DiNunzio belong to the Four Lanes End Garden Club of Langhorne, Pa. 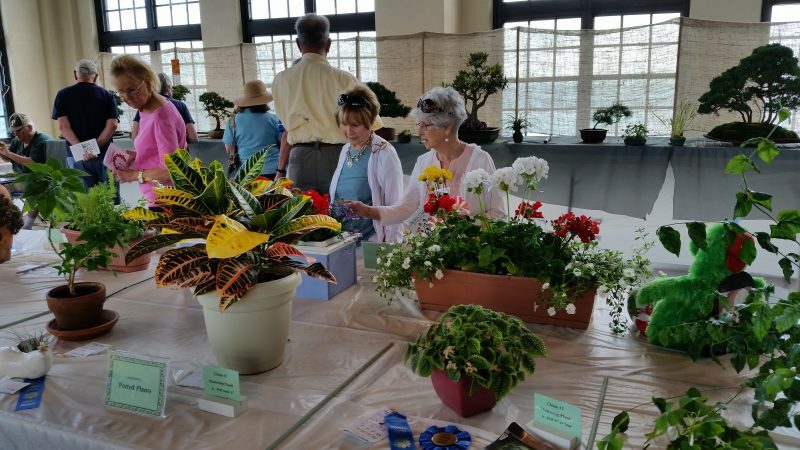 In all, about 50 members of their club attended the flower show on Friday during a bus trip to Ocean City that also included lunch at the historic Flanders Hotel. “Some of the ladies in the club had never seen Ocean City before. They needed a place to go for their annual field trip, so I suggested that they come here,” said DiNunzio, a former president of the Four Lanes End Garden Club. Reilly and Wheatcroft noted that the flower show routinely draws attendees and exhibitors from Pennsylvania, New York and North Jersey, as well as local towns. Often, the attendees will make the show the centerpiece of a weekend trip to Ocean City, they said. Wheatcroft said the show consistently offers high-quality floral displays, making it a popular attraction for both novices and serious gardeners for 45 years. “So many people come here, it’s almost like a smaller version of the Philadelphia Flower Show,” Wheatcroft said. “I think it is as attractive as the big Philadelphia Flower Show, which is beautiful. But there, you can’t get as up close and personal as you can at this one,” Reilly added. 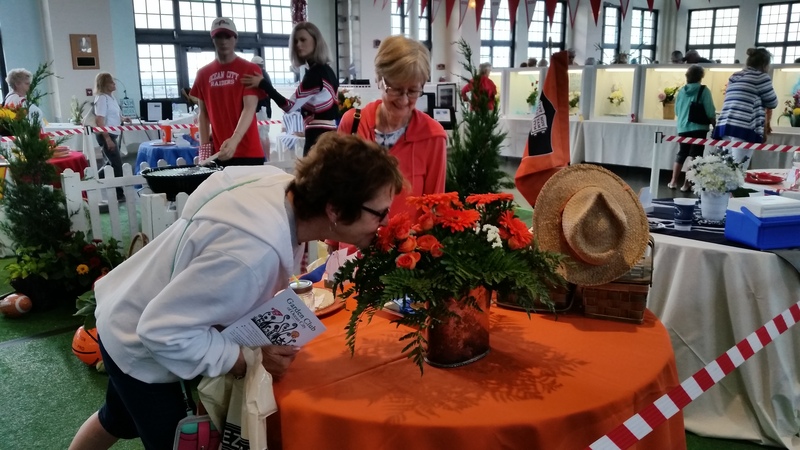 This year, exhibitors competed for prizes in different divisions for their “floral interpretations” of the sports world. Attendees were able to pick up some gardening tips in the flower show’s horticulture section. The Ocean City Flower Show continues Saturday from 10 a.m. to 9 p.m. and Sunday from 10 a.m. to 4 p.m. at the Music Pier, Moorlyn Terrace and the Boardwalk. Admission is free, although donations are accepted.